Since this is our FIRST "Plant of the Week" post, I selected an early spring bloomer to get you into gardening mode. 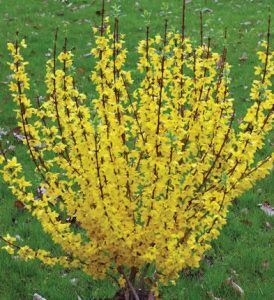 The Show Off Forsythia is a new compact selection that gives a stunning display compared to some of the older forsythia varieties. Its early spring blooms fill its branches with bright yellow color in early spring. It has lovely dark green foliage that provides visual interest all season long. 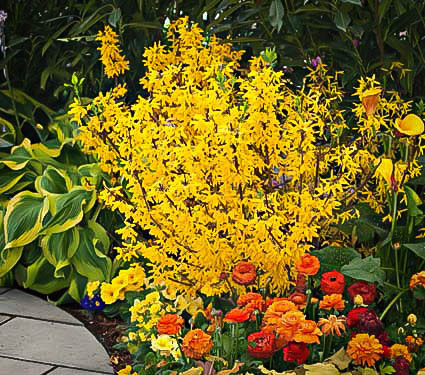 Planted as a short hedge or in mixed borders or even as a foundation plant, it produces blooms that work well as a cut flower.